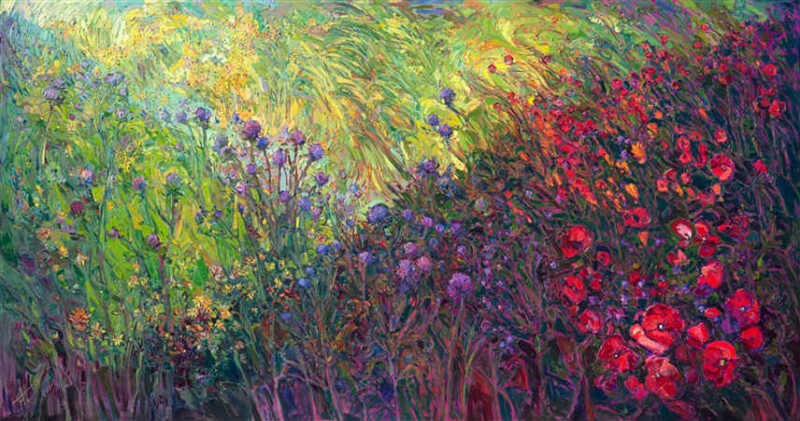 Often referred to as an Impressionist, Erin Hanson designates the nature as her greater influence. Inspired by van Gogh, The Group of Seven, the early California Impressionist, and Japanese art, everything she sees shapes the way she looks at things, structure, color, and composition. Although some of her paintings could be considered more expressionistic or colorist, Hanson herself coined a phrase “Open Impressionism” after many people noticed that they had never seen the style like her before. Satisfied with the idea of her oil painting approach being united by traditional terminology, her technique of bending and testing the rules of traditional oil painting and searching the best capture of light and color the way she perceives them, correspond to the label “open”. Aware of her passion for the arts from a very young age, as a child she painted commissioned portraits of her neighbor’s pets, experimenting with various mediums and styles. Her first encounter with van Gog’s Irises in elementary school was decisive and has marked the beginning of her appreciation for Impressionism. She spent much time in the school’s art room working diligently on some new project and at home she used to perch on the bathroom sink drawing her face in the mirror, over and over again, practicing. Her first insight into the world of art as business was her engagement at a mural studio during the teenage years. Following the advice of the adults around her that artistic career “wasn’t practical”, Hanson decided to focus on her other passion, Biology when she went to college. She earned a Bachelor of science at UC Berkeley. 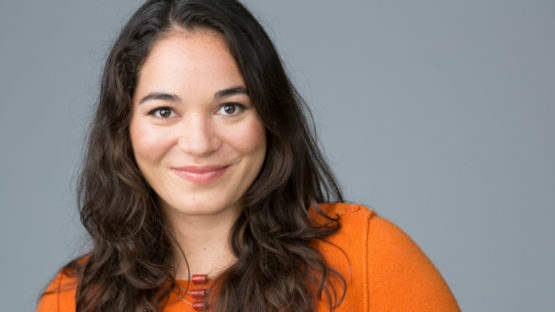 Starting a business after the studies, she moved to Las Vegas and on her way to a new city she was fascinated by a desert sunset over the stark mountain peaks. Overwhelmed by a burning desire to paint again, she promised herself she would create one painting every week, despite everything else. It was ten years ago and she is still keeping her promise. 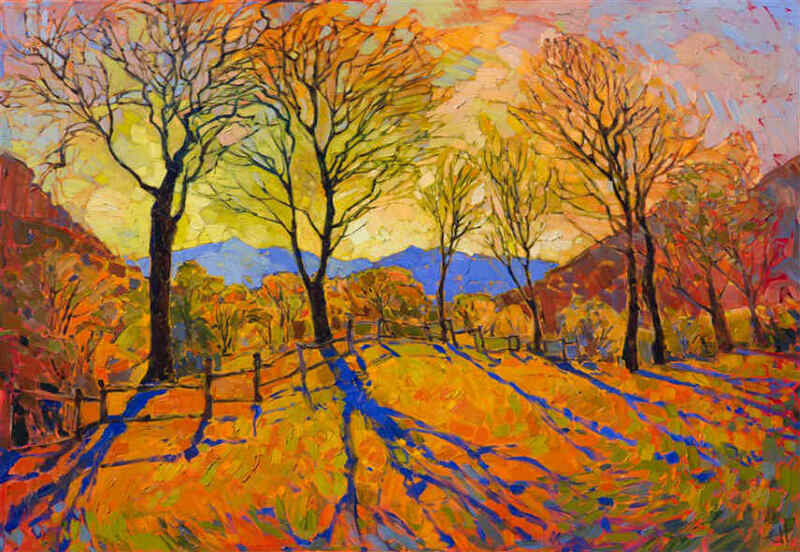 Beginning her creative process, Erin Hanson first step is always to go out into the world, too far off parts of the countryside or out into the National Parks. She tries to travel to a new location every few months to get inspiration for her next series of oil paintings taking pictures and doing sketches as references. Most inspired by colorful sunsets and dawns, in order to achieve adequate tones, Hanson mixes paints from a limited palette of 4-5 colors which gives her complete control over it. Striving for minimal brush strokes and paint “ala prima” (wet-on-wet), she has to move and think fast. Primarily focused on landscapes, she always sees something new in their abstract shapes and compositions. Since she grew up in the city, she was always looking forward backpacking trips and the explorations of the natural landscape outside the urban environment. One of her favorite places with which she feels the most emotional connection is the Four Corners area, including Canyon de Chelly, Zion National Park, and Monument Valley. 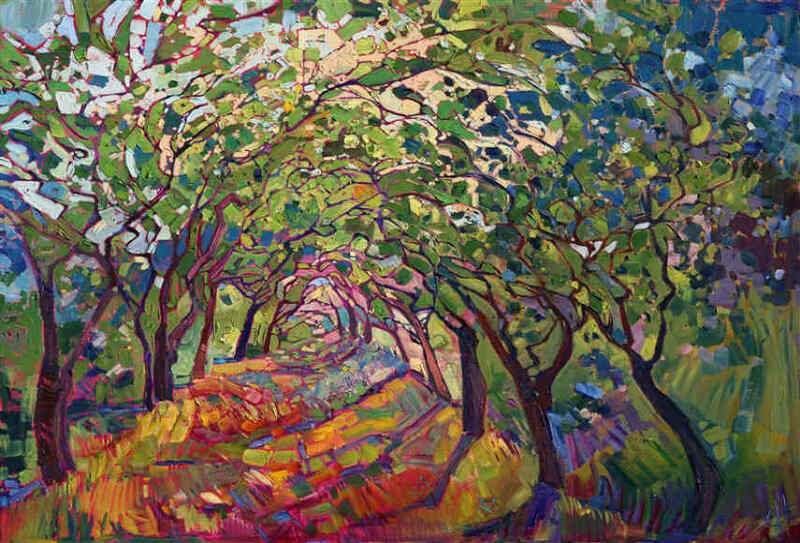 Proud of her paintings, Erin Hanson loves when her work creates an emotional response, making people take a second look at the natural beauty all around them. Wishing to each individual has his own experience inspired by the painting, she hopes that her paintings will bring life and joy to every viewer, a sense of adventure or wonder. Naturally, Hanson’s style evolved and matured, but after so many landscapes painted over the years, she is certain about only one thing: that she creates what makes sense to her at the moment and that each of her paintings and each experience informs the next. Among her recent successes is her collection at the St. George Art Museum focused on the National Parks, honored their centennial and at the moment she prepares Orange Collection Exhibition that represents a new venture of focusing on a single color for a whole series as a way to really delve into the boundaries of “orange” and explore how it can be used in different landscapes to create emotional impact. Always looking for ways to push herself artistically and challenge the way she thinks about color and composition, she knows that result that comes out will be amazing. Among her opulent oeuvre, Hanson will always single out The Path and Chrystal Light as two pieces that became a part of their own eponymous series over the time, proven to be significant and much beloved. There is also Fields of Blooms, the largest single canvas she has painted in oil. Measuring at 13-feet, it was both challenge and joy to bring it from concept to completion. 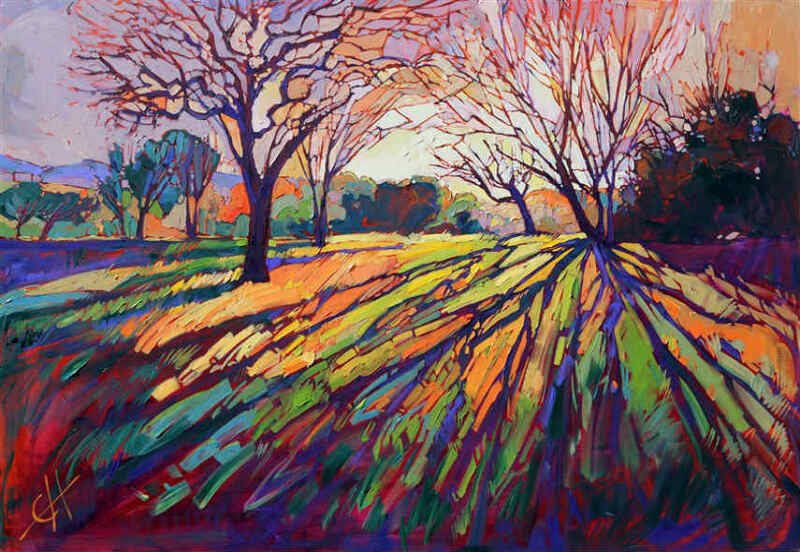 She is looking forward to the future exhibitions, such as Impressions of California, her 5th annual solo show at Studios on the Park, Paso Robles, in Central California which will be followed by Erin Hanson: The Orange Show in her Los Angeles gallery. On the other side, she is very excited about week-long backpacking trip with her brothers into the Grand Canyon and then over into Paria Canyon that will provide enough inspiration for her succeeding series.